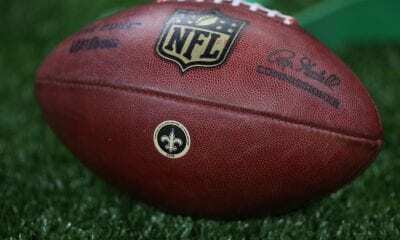 Let’s begin with this: Super Bowl LIII had a much fizz as an open Pepsi after a night on the counter. But flat only skims the surface when it comes to the lowest scoring game in league championship history. After two weeks discussing the foibles and non-calls defining the AFC and NFC Championship Games, most of the chat around the snack room Keurigs across the country was likely about Adam Levine and all his of tattoos. That was impressive. Of course, it wasn’t that way throughout New England. The New England Patriots figured out a way to unplug the high-voltage offense of the Los Angeles Rams to win their sixth Super Bowl in the Bill Belichick Era. Final score: Patriots 13, Rams 3. 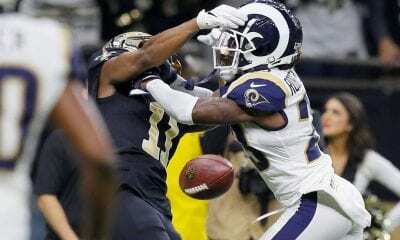 You’ll be reminded this was the first time the Rams had ever been shutout on Sean McVay’s coaching clock and the six points the teams combined after three quarters was the lowest output in Super Bowl history. Did you know the Pats still have not scored a first-quarter touchdown in any Belichick Super Bowl? New Hampshire, Vermont and Rhode Island could care less. Yes, his has been quite the four months for Boston sports fans, quite the bummer for those in Tinseltown. First, the Red Sox beat the Dodgers in the World Series. And now this. Call it the Hollywood Walk of Shame. 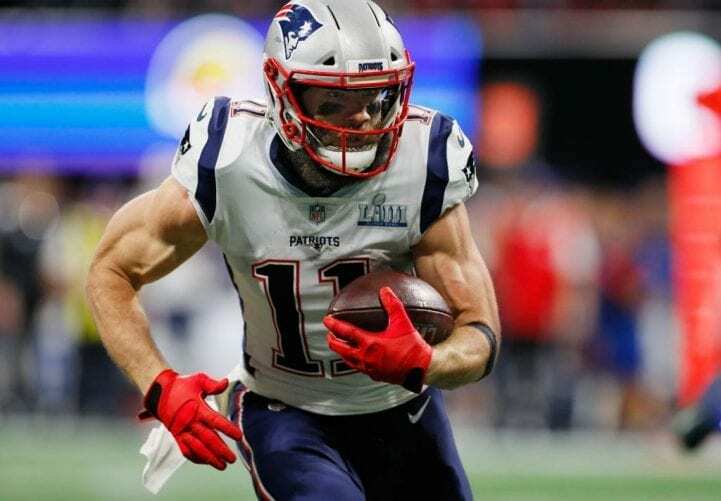 Since the game failed to produce many individual highlights not produced by Super Bowl MVP Julian Edelman (10 catches, 141 yards), we suggest focusing on the picture depicting how far greater the Patriots dynasty is than anything that’s preceded it in league history, perhaps sports history. 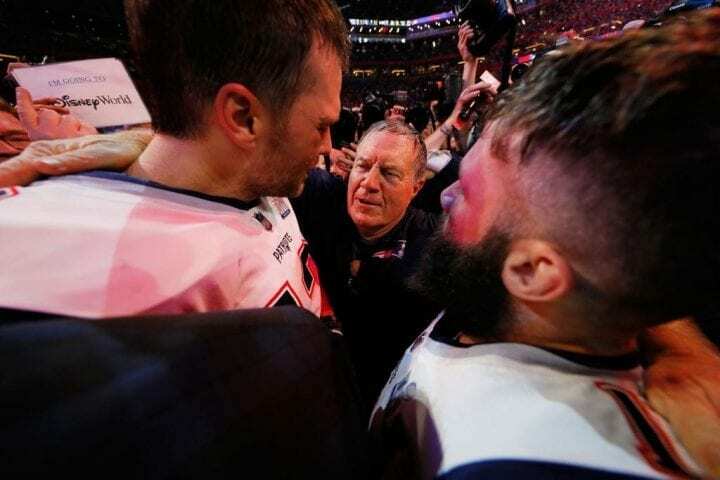 The sixth Super Bowl championships have come since 2001 when Belichick and Tom Brady were united for the first time out of necessity. Jets linebacker Mo Lewis roughed up New England starting quarterback Drew Bledsoe in Week Two of the 2001 season at Foxboro Stadium. The chest-high hit that knocked Bledsoe out of bounds left him with a concussion and internal bleeding. He was hurt so badly concerned EMTs rushed him to Mass General Hospital in Boston fearing for his life. Bledsoe never started another a game for the Pats. Now, Brady’s six Super Bowl rings provide sufficient evidence for those referring to him as the greatest player in NFL history. One thing is for sure. Brady is the oldest quarterback to win a league championship. It is also Belichick’s sixth league title as Patriots head coach – in nine tries over 19 seasons. The general public may know him for his banality and sweatshirts. His cryptic pregame interview with CBS only furthered his crotchety nature. But he is also now the oldest coach to win a league championship. Brady and Belichick are to football what Abbott and Costello were to comedy. The game has never seen a tandem with better timing. They have now won 30 postseason games together, 16 more than any other pairing. George Halas and Curly Lambeau, among the league’s founding fathers, are the only head coaches also with six championships. These Patriots have taught us all a great lesson about what makes them prodigious. They do not give up after starting a season slowly. This time is was 2-2. They gain momentum at the second quarter-pole. They find fuel in the sarcasm spewed predicting their demise. They survived after five road losses to teams who didn’t make the postseason. And they are remarkably well-prepared and play with great confidence. After gaining 1,100 yards in their last two Super Bowls, the Pats had just 407 on Sunday. But their poise was exemplified over the final 15 minutes. First they engineered their only touchdown drive. Brady took them 69 yards, hitting tight end Rob Gronkowski for gains of 18 and 29 yards, setting up rookie Sony Michel’s score. And then, cornerback Stephon Gilmore ended what appeared to be L.A.’s response by picking off Jared Goff in the corner of the end zone. The game showed why Edelman and Brady are adjoined. Only Jerry Rice has most postseason receiving yards. And it showed why other league teams covet their assistants. Last year, defensive coordinator Matt Patricia left for the Detroit Lions and now linebackers coach Brian Flores with coach the Miami Dolphins. The defense Flores helped designed shutdown the Rams ground game, making it tougher, virtually impossible for their air attack to compensate. Remember, the Rams averaged 32.9 points in the regular season. Goff, uncomfortable all night, had just 229 yards passing. The nine Rams punts were a season high. To win this league title, the Patriots had to throttle three of the best offenses the NFL had to offer – San Diego, Kansas City and the Rams. And it did. 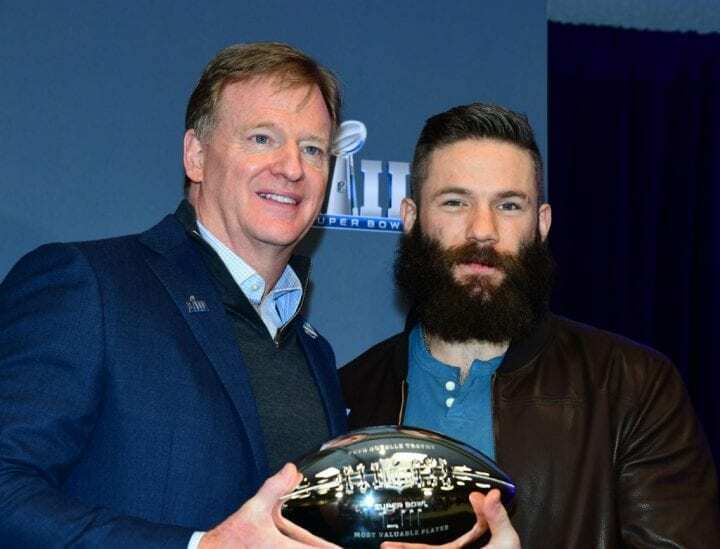 Meanwhile, eight of Edelman’s receptions were for first downs. Brady likely has had no better route runner at this side and this was some way to end a season beginning with a four-game suspension after failing a league drug test. 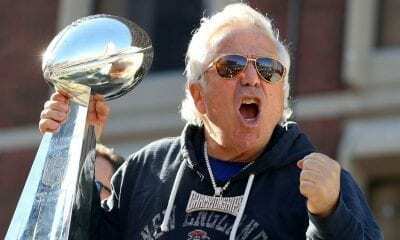 Once it was over, Patriots owner Robert Kraft carried a humidor filled with cigars into the locker room for his players. They weren’t 7-Eleven issues. They were 50-year-old Padrons, given to Kraft as a gift from the maker’s family. He’s been holding to them for a year after last season’s loss. If the 2018 season taught us anything it’s to expect Kraft to have another batch ready next season. Light up, PatriotNation. There’s no better bet in sports.